Some observations but also downsides. In 2013 I travelled from Buenos Aires to Patagonia to Lima to Machu Pichu to the Amazones to Colombia to San Fransisco. The trip lasted six months and I worked for two days a week while I was travelling over whatever wifi I could find. I was an independant contractor and lecturer and I still had some clients from Holland. It has never been easier to travel and work. If you need a place to live for a month you can just check up on airbnb and if you need a more professional place to work from then there’s plenty of flexible workplaces. You can communicate code with basecamp, call people on skype and you can use git to keep your source code in check. Tim Ferris actually had a point. I only worked for two days a week and that was enough to live the good life in South America. Earning euro’s and spending pesos gives you a lot of purchasing power. If you are a developer and want honest travel advice your best chance of finding it is at stackexchange and reddit. The sites themselves rock, the travel sections are no exception. 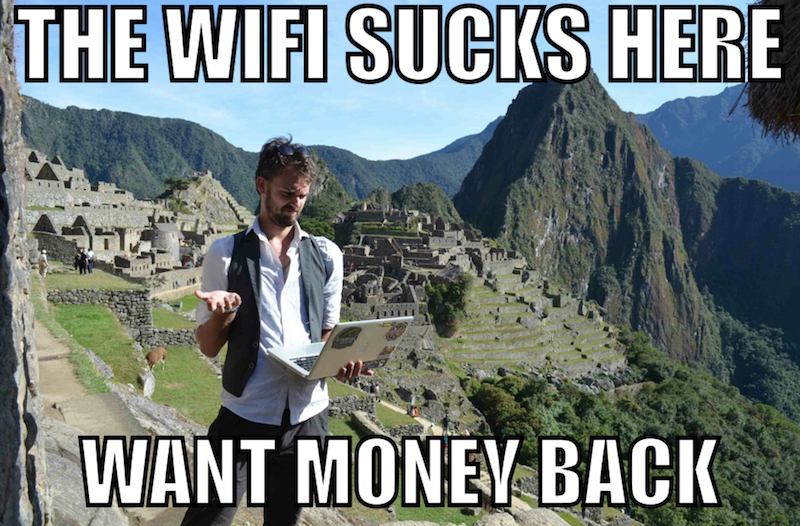 Wifi can both fail and work at suprising places. One town can have 10 Mb/s speeds and the town 10 miles further might have no internet at whatsoever. The wifi in the amazones was better than the wifi in Lima. I remember sitting on a couch in the hostel next to a monkey. As I was feeding him a banana I was pushing commits to the github repo. Patagonia had the worst wifi. This was the actual postcard that I actually took and sent to my friends. The wifi was indeed horrible. You learn a lot from coding if there is no wifi. Instead of relying on stackoverflow for everything you don’t know you learn think for yourself again. You find the need to save docs beforehand to fully grasp a library instead of just copying snippets of others. This prevents some intellectual lazyness and teaches you to use snippet collector. Coding is awesome. Unfortunately certain destinations don’t facilitate this. A place can be amazing to be a tourist in but horrible to be working from. That surfing spot needs to have wifi, that party city needs to have some stability during the week and that in the middle of nature in the middle of nowhere place becomes a risky work location should hardware fail. If you are working on your own there aren’t many collegues that you can learn from. Some cities offer meetups so you can talk to like minded professionals but it’s different. There seems to be a small shortage of like minded developers who are pushing limits that travel the world. The people that you learn from are usually older, have a wife and kids and are probably not travelling the world. Learning a computer language and learning a natural language is a similar thing. It gets easier the more and more you use it and you will only really start to understand it if you are forcibly required to do so. A deadline really helps you understand that library in the same fashion that that really cute Argentinian girl motivates you to improve your Spanish. You cannot start a company when teammembers are not sitting next to eachother. It is a nice dream but not a reality in my mind. In early stages of building a startup too many things change too often. You cannot afford ambiguity in the earliest stage. Once a platform is stable however, it would definately be do-able. The relationship between employee and employer requires a huge amount of trust at this distance. The guy on the other side trusts that you will do work for him and you need to trust him that the money will be paid. Not all my clients paid on time, but the ones that did are gained my trust just as I gained theirs. For me the trip would have been worse if I didn’t bring work with me. It was a trial to see if coding was going to be my trade or if something else would make more sense. It was less of a vacation and more of a pilgrimage. By the end of the trip, bars seemed less interesting and books started showing it’s appeal. I learned that I should never have studied econometrics and that computer science or physics would’ve made more sense in hindsight. I can recommend such a trip it to anyone, but I cannot imagine (or recommend) anyone doing this for their entire lives. Having to explain yourself over and over again to people can be quite a drag and I really started to miss having proper friends and family around.